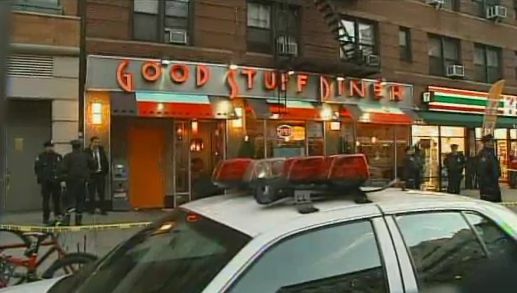 Early in the morning of Tuesday, July 1, two rival gangs bumped into each other in the Good Stuff Diner on West 14th Street in Manhattan. Their animosity soon tumbled into the street, where they proceeded to reenact the gunfight at the OK Corral. The difference between those two events? In the Good Stuff Shootout, only one person was hit, and escaped by cab to a nearby hospital. This is just the latest evidence of a curious trend in New York City. Since January 1, in the five boroughs, over 500 people were hit by bullets, a 13 percent increase over the comparable period a year ago. Then in May, the number of shootings went off the charts. In the 28 days from May 14 – June 10, 41 percent more people were shot, compared to the same four-week period last year. But despite the increase in flying hot lead, homicides are down. So far in 2014, there have been 120 murders, a 15 percent decline. So how does more shooting result in fewer murders? Steven Messner, a criminal justice professor at the State University of New York at Albany, says that despite the increase in shooting victims, the declining homicide rate reflects in part improved emergency medical response times that turn fatal shootings into non-lethal events. I see two other possible explanations: 1. The Department of the Interior has bought up all the quality ammo. 2. The marksmanship of gangbangers has taken a serious dive. Since Mayor Bill De Blasio has made it necessary for the NYPD to “reform” the stop and frisk policy, that sounds like the better reason. Now that any wannabe shooter can pack without fear of being searched, the number of crappy shooters has likely gone way up. That has to be good news to all the mothers in Bed-Stuy, Harlem, East New York, and the South Bronx. When the crappy shooters in those neighborhoods miss other crappy shooters by a mile, and their rounds go through your bedroom window, it’s all good. The commish knows where the crappy shooters are and what they’re up to. Personally, I think my recently deceased mother had a thought that is more relevant. She was a piano teacher, and frequently told her students, “Practice makes perfect.” Now that New York’s gangbangers are free to carry at will and shoot whenever the mood strikes, their aim should become a lot less crappy. ← Who’s the looniest city in America? Introducing The MoonPie Award.